Who doesn't love a good egg roll? And no, we don't mean the kind that comes with Chinese takeout. Actually, we do love that kind, but most importantly: More than 35,000 lucky kids and their parents converged at the White House Monday for the annual Easter Egg Roll. Following a performance of the National Anthem by "The X Factor" alumna Rachel Crow (born in 1998 -- feel old yet? 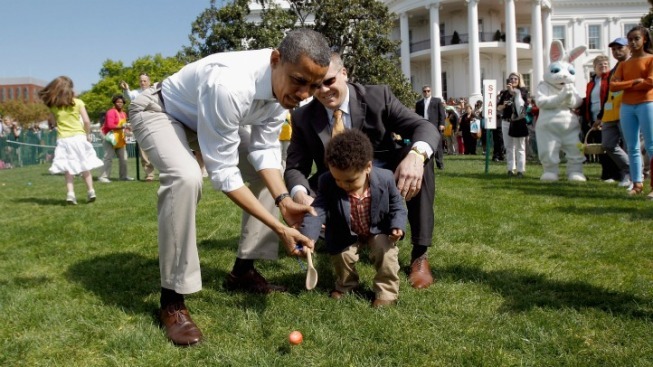 ), the Obama family joined the kiddos rolling eggs across the South Lawn of the White House. 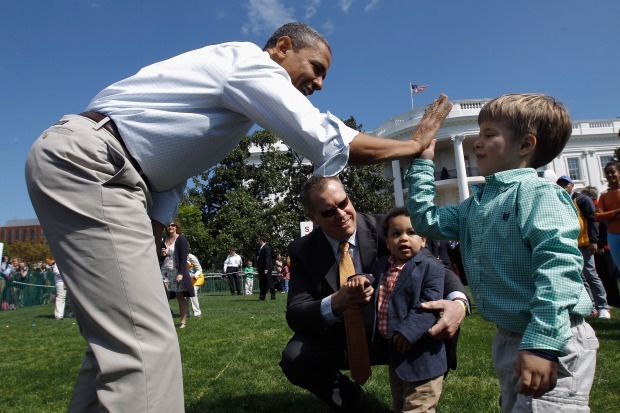 The president helped some of the littlest guests with their egg-meets-spoon attempts. "We're going to be over there doing a little egg roll," Michelle Obama had told the crowd earlier. "I think the president is going to try to beat a three-year-old -- which I hope he does not." President Obama participates in the Easter Egg Roll festivities at the White House. The first family spent time at the Storytime Stage, with Obama introducing "the two best readers in the family," daughters Sasha and Malia, who traded off reading pages of the children's book "A Sick Day for Amos McGee," while their parents looked on. First Dog Bo was curled up at Michelle's feet. Afterward, Obama continued his annual tradition of reading Maurice Sendak's classic "Where the Wild Things Are," inviting the kids to roar along with protagonist Max. 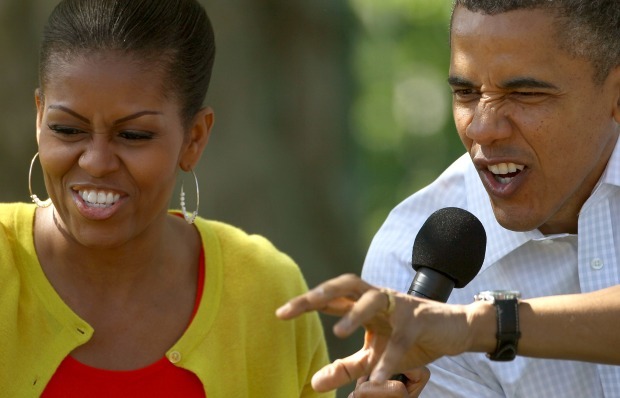 Obama roared and ad-libbed a little, gnashing his teeth and asking the kids to do a wild rumpus. Bo played along, barking, and the crowd went wild. The little kids drew their "claws," eliciting big laughs from the first couple. When the president moved on to basketball, Michelle stayed and gave an solo reading of "The Little Mouse and The Red Ripe Strawberry and the Hungry Bear." She sat closer to the kids and invited them to guess what happened next. Michelle moved on to the Kids Kitchen station at 11:15 a.m., with celeb guests were on hand to take over at the Storytime Stage. Robin Roberts, Julianne Moore, "Diary of a Wimpy Kid" author Jeff Kinney and Forest Whitaker were among the readers expected. As usual, the first lady's "Let's Move" initiative to fight childhood obesity is a party of the day's theme, which this year is "Let's Go, Let's Play, Let's Move." At the Play with your Food station, Chefs Andrew Zimmern, Marcus Samuelsson and "Top Chef" alumni Carla Hall and Bryan Voltaggio are sharing healthy eating demos. The White House chefs will also put in an appearance. Athletes at in the Eggtivity Zone will include Dominique Dawes, Michelle Kwan, NFL players such as Brian Orakpo, Ovie Mughelli and Lorenzo Alexander, "The Biggest Loser" trainer Bob Harper, and four members of the Harlem Globetrotters. The president stopped by as well, to shoot some hoops with kids and joined a nine-year-old from Los Angeles in a game of tennis. Guests enjoyed the festivities in two-hour shifts. Most had entered an online lottery, but many military families were granted tickets without having to take their chances online. The White House also lengthened the event this year, allowing for about 5,000 more guests to visit than in past years. No word yet on whether Bo is donning his bunny ears.